allmigo® allergy friendly foods llc proudly sold its first food product on april 1st, 2017. we acknowledge this as the day we became people for food allergy safety®. so why did a humble dad start a family–owned food company? because of the way of love: he who refreshes others refreshes himself (Proverbs 11:25). as people for food allergy safety®, the allmigo® american brand is dedicated to helping people eat broader and live unlimited. 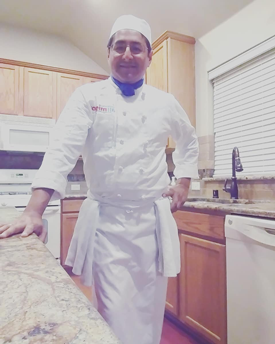 after giving epinephrine and rushing his daughter to the ER from an anaphylactic reaction to a product with undeclared presence of peanuts, russelbraga discovered his mission of love to cook and bake allergen–free foods for one of his three daughters who has a life-threatening peanut allergy. russel's daughter natalia is also sensitive to other food allergens, and she suffers from peanut cross-reactivity to lentils. like many parents of children with life–threatening food allergies, our family struggled for years trying to find all–natural–back–to–basic foods that are conveniently safe, rich in taste, and completely free of all the top eight food allergens identified by law. label reading and phone calling for straightforward answers about potential cross–contact with allergenic food ingredients had become a daily struggle for our family. russel’s wife also suffers from gluten sensitivity due to an autoimmune disease she was diagnosed with years back. when making family meals based on dietary restrictions became a challenge, russel asked God in prayer to help him be an instrument of His love, so he could refresh others who suffer with life-threatening food allergies like his daughter. after nine consecutive months of initial research and development dating back to 2016, God through His divine providence gifted russelbraga with the first set of proprietary food product formulas which are beyond free of all the top eight food allergens. russel also enrolled in culinary school at night to learn new skills and became the cook and baker for the family. 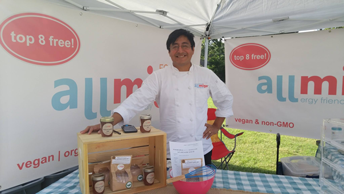 in honor of God and his family, and as an outward sign of love for those with life-threatening food allergies like his daughter natalia, russelbraga founded allmigo allergy friendly foods, llc, a family owned and operated food company dedicated to helping people eat broader and live unlimited. as people for food allergy safety®, we are passionate about producing, researching and developing uniquely safe foods that are rich in taste, convenient, and beyond free of all the top eight food allergens identified by law, and we are building an allergen–safe place where people can find, discover, and buy the allmigo® brand products.